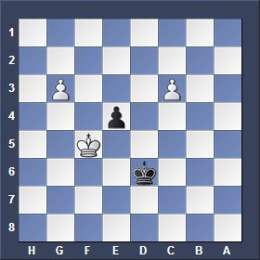 Can the first move of a pawn be a diagonal capture or does it need move forward one or two spaces before capturing? a pawn can capture anytime no matter if it sits still on its original square or not. See position below where Black will promote a pawn into a queen. For that a black pawn must reach the last rank. To achieve this Black will sacrifice his g-pawn to free the way for his e-pawn. Black plays 1...g3 and attacks the white f-pawn on its original square. The white f-pawn has never moved before. The f-pawn will capture 2.fxg (or the black pawn will move ahead and promote) and after that Black can move his e-pawn forward playing 2...e3. The white king cannot catch the black e-pawn anymore.